“What’s the point in having a mate with a time machine if you can’t nick back and see your gran when she were younger?” — Yasmin Khan. 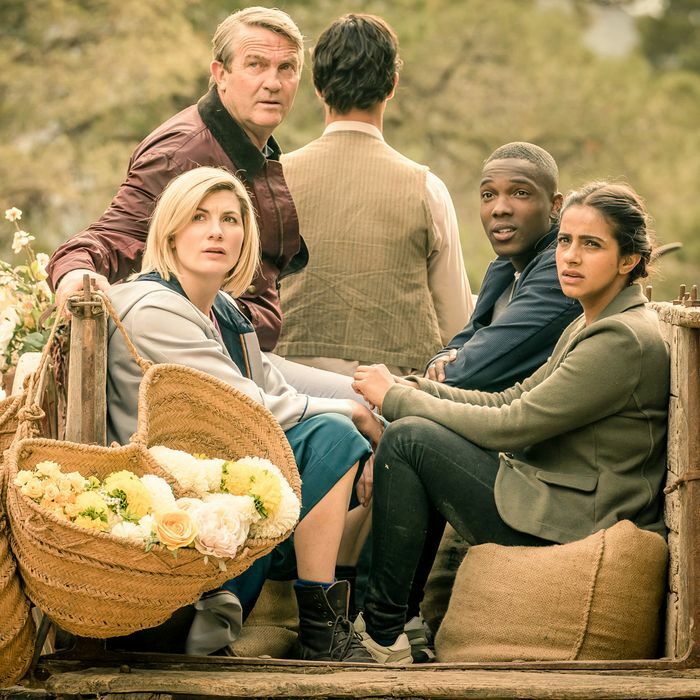 “The Demons of Punjab” marks the halfway point of season 11 and the first script of the year without Chris Chibnall’s name on it, which makes for a pleasant change of pace, because the show needs more voices guiding and shaping it. Vinay Patel takes the sole writing credit here, and based on numerous tweets, he’s clearly got a great deal of passion for the subject of the Partition of India. I urge you to check out everything he has to say (after you’re finished reading me, of course). This is the most exciting episode of the season yet. Exciting because once again it takes us into a period of history, only unlike “Rosa,” I knew literally nothing about this subject. I suspect this history is largely unknown to a substantial portion of the Doctor Who viewing audience as well. But between “Rosa” and now this episode, Doctor Who appears to be on a mission to enlighten and inform its viewership. This is nothing new. In 1964, the Doctor and his friends visited Mexico in the time of the Aztec empire, and last year the Doctor and Bill went to an ice fair on the frozen Thames. If you’re going to travel through history in the TARDIS, it’s always better to learn something factual along the way. Indeed, history is proving extremely fertile ground for this season to plow, certainly yielding more rewards than in its pure sci-fi outings. Things start going even more askew when the demons arrive, seemingly having killed the holy man who was set to perform the wedding. This episode arguably hits home the mission of this new Who better than any of the episodes previous — yes, even “Rosa.” As great as “Rosa” was, it still had that subpar villain dragging bits of it down. “Demons” has no such issue, as the aliens of the title turn out to be fascinating creatures — but again, not villains in the traditional Who mold. A race of ex-assassins, the Thijarians have abandoned their old ways and now only watch over and honor the dying. They “travel all of time and space” and “read the time waves” to find those in need of their calming presence. Wars and violent uprisings are ideal places to scavenge for their noble purposes. The Thijarians are the most compelling race the series has unveiled this season, and I’d love to see more of them, including a prequel story from back when they were still the “deadliest assassins in the known universe.” That particular phrase, which is the Doctor’s, may reference the classic Tom Baker story “The Deadly Assassin,” whose redundant title in recent years has received a bit of heckling from, if memory serves, Steven Moffat, who pointed out that if an assassin isn’t deadly, he’s not very good at his job. Did I say he? It’s also worth noting that the Thijarians are played and voiced by women. It seems like every episode this season has at least one great little scene between two of the regulars that brings everything about each episode into focus. Here, it’s between Graham and Yaz, with Yaz questioning everything she thought she knew about her grandmother, and Graham wisely noting that the woman they’re dealing with won’t be Yaz’s grandmother for a long time to come. He explains, as only Graham can, “I honestly don’t know whether any of us know the real truth of our lives, ’cause we’re too busy living them from the inside.” He then has to remind Yaz of the wonders they’re currently living thanks to the Doctor: “We’re in 1947!” It’s already become a way of life for these three people, and perhaps the younger pair need a reminder to not take it for granted. While I would love to say something profound about the Partition, the middle-aged white guy from Texas who has just barely learned of the subject should probably not try to wax poetic on the topic. What I do feel I have the authority to discuss are the parallels that Prem draws when he speaks of the tragedy of “normal people losing their minds” and how his brother Manish (Hamza Jeetooa) spends too much time “reading pamphlets and listening to angry voices on the radio.” Chilling commentary on the state of the world today, that is. It isn’t a stretch to see Patel using this piece of history as a horrific warning for us all to heed, most notably with his line: “Now we’re being told our differences are more important than what unites us.” Prem is a brilliantly nuanced character, and his tragic ending is one of those fixed points in the Whoniverse that nobody has the power to stop. The wedding ceremony is an episode high point, especially given that the time travelers know what’s around the corner for Prem. Performing the ceremony, the Doctor is utterly in that moment, not an hour or two ahead, when Prem will die. She enthusiastically carries out her duty with all the hope and love that she can — well, muster isn’t the right word, because it comes easy to her. She makes the moment as special as possible, because soon hope and love will feel in short supply. The title of the episode works on two levels: the obvious demons in the form of the Thijarians, but also the societal demons of pressure and anxiety the guest cast wrestles with — the demons that will lead an impressionable young man to assist in the killing of his brother. “Demons of the Punjab” is exceptional Doctor Who on pretty much every level, and a massive round of applause to the production team and director Jamie Childs for delivering something so engaging and adult and educational. Some folks will take serious issue with the Doctor’s indulging Yaz and allowing this scenario to go down, but that misses the beauty of Doctor Who. If previously established rules or canon are adhered to too closely, then all of a sudden barriers to good storytelling start going up, and one thing Doctor Who must always do is bash down barriers, not erect them. Imagine if this story had not been realized because someone felt it would be going against the laws of time for Yaz to meet her grandmother when she was young! That’s no way to run this series. Make the episode with the fantastical premise, and then fans retcon the scenario so that it makes sense within the Whoniverse (and believe me, they will). Doctor Who must always be about the infinite possibilities.